Piriformis, hamstring and calf muscle tension very common in runners. Some may argue this comes from excessive use and adaptation of the muscular system. The increased tension means more efficient springs and better energy conservation. This is fine if the muscles remain elastic but not tight to the point that normal motion is restricted. . 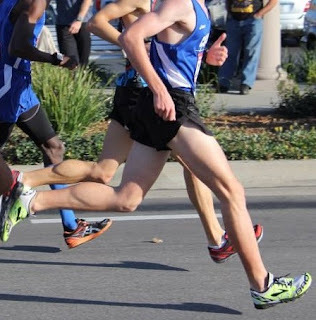 Many runners are well aware of extreme tightness that can occur in these areas. Hamstring and calf injuries along with piriformis syndrome are common in the running population. Often the extreme tension is from a lack of flexibility training and weakness of muscles elsewhere that these muscle groups are compensating for (glutes or ankle stabilizers). So many people go about a normal flexibility routine after every run or so and try to work on balancing themselves out strength wise. Sometimes though.... that muscle tension doesn't go away. In fact it keeps getting worse. As a clinician, that's when I start to suspect involvement of the sciatic nerve. The sciatic nerve is the major nerve to the lower leg. It is made up of the L4 to S3 nerve roots from the spinal cord. The nerve roots come together and pass in or underneath (depending on your anatomy) the piriformis muscle deep in the hip. From there it exits the pelvis, passes through the hamstring muscle group close to the adductor magnus. 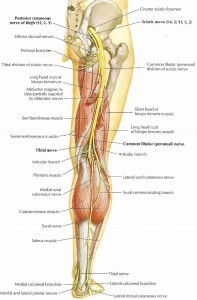 As it hits the knee, the sciatic nerve splits into the common fibular and tibial nerve portions. The fibular nerve curves around and passes in front of the lower leg and innervates all the dorsiflexors and toe extensor muscles. The tibial nerve passes behind the solueus and controls all of the calf muscles. The tibial portion also continues into the plantar aspect of the foot and controls many of the intrinsic toe muscles. Notice how close that nerve gets to or goes through several muscles that are commonly tight? The piriformis, hamstrings and calf muscles are all muscles that get tend to get tight in runners. When those muscles are either over utilized or become to tight, they can compress the sciatic nerve (or the various branches). Nerves in the body do not like being compressed or statically stretched. They have specific canals they need to slide and glide through for optimal function. So when they get stuck or compressed, the muscles they innervate may start to get tight. Common signs of nerve compression or irritation may include numbness, tingling, burning, chronic tightness and/or chronic pain. The sciatic nerve has the most tension placed upon it with hip flexion, knee extension and ankle dorsiflexion (further tension can be create from spinal flexion and other things from higher up the chain but that is for another post). Combining all three of those at the same time and holding it is a great way to stretch and irritate this nerve. 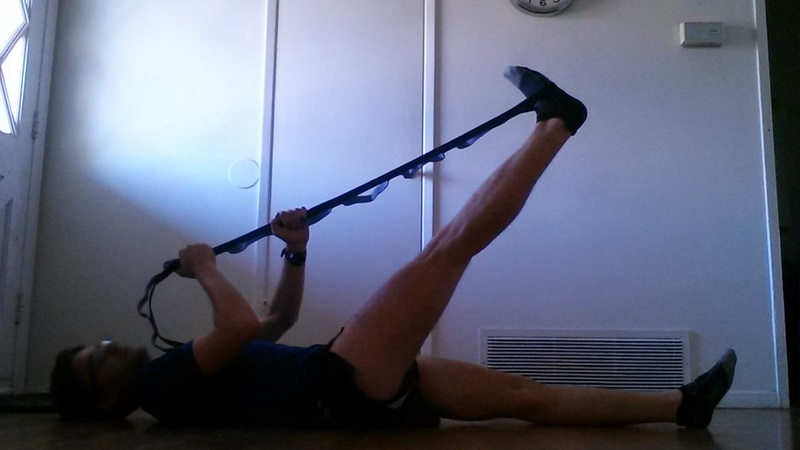 So the classic hamstring stretch that people do where they also pull their ankles into dorsiflexion? That's not your hamstring getting stretched. That would be you attempting to statically stretch a tissue that is not supposed to do that. As I briefly mentioned earlier, nerves do not stretch but instead must glide and slide through specific canals in the body as we move. Given that they do not stretch, those canals need to be kept open for optimal movement. Normal compression or stretch will occur with certain activities, kicking a soccer ball for example (that usually involves hip flexion, knee extension and ankle dorsiflexion) but they must only occur for a brief moment and not repeatedly for long periods of time. Those most likely to be irritated by overly stretching the sciatic nerve in the running population are those that tend to overstride. As you can see from the photo below, most people that tend to overstride (and you know you've seen this) usually put themselves in a position that would create tension on the sciatic nerve (hip flexion, knee extension, ankle dorsiflexion). Now imagine that you keep trying to do that and the nerve is caught somewhere in the lower extremity. You are continually pulling on something that does not like being excessively stretched. Does it make sense why you may have continual tension is certain areas? That may be from you continuing to pull on that nerve. Image from SBR Sport. Hip flexion, Knee Extension and Ankle Dorsiflexion. Add the additional compressive load from landing hard in front of you and this may put you at risk for irritating and excessively stretching the sciatic nerve. To help those nerves move a little better, we can use techniques called nerve flossing. This can isolate the common areas of tension and help the sciatic (or distal branch of the sciatic) nerve glide better through those canals. What is very cool about these techniques is that you may see an improvement in flexibility and decrease in pain after doing these (you may also have increased soreness but SHOULD NOT have pain). Why? Because when you reduce tension on a nerve, the muscles innervated by that portion will generally relax. When a nerve is compressed, it tends to send odd signals to the tissues it innervates. This tends to bring on a protective reflex in the muscles, leading to increased tension. Reduce the threat to reduce the tension. These techniques should be done for no more than 5 minutes at a time and should always be done SLOWLY. I usually start people out with 2-3 sets of 15-20 oscillations or 2-3 sets of 1-2 minutes. DO NOT HOLD THESE STATICALLY! Use a strap (like the Stretch-Out Strap or a dog leash) to help hold the foot. Once you finish with these techniques, then go back to your normal calf, hamstring and piriformis stretches and you may find that some of that flexibility stays. Hip Floss. Oscillate between hip flexion and extension with the knee straight and the ankle held in dorsiflexion. For those with chronic hip or upper hamstring tightness, mobilizing the sciatic nerve at this point may be helpful. Lie on your back, keep your knee straight, keep your foot dorsiflexed as much as you can. Bring your leg up until you feel tension in the hamstring or calf. 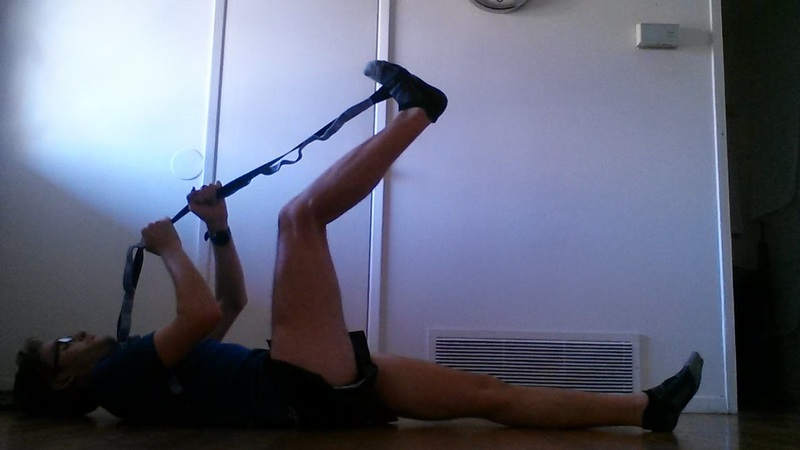 Use a rope of some kind to oscillate between hip flexion and extension. DO NOT push into pain or extreme tension. Go up right before that happens but no farther. You do not want to aggravate your nerves. You want them to move better. Knee Floss. Oscillate between knee extension and flexion with the hip at 90 degrees and the ankle held in dorsiflexion. For those with tension behind the middle knee, chronic hamstring or calf tightness. 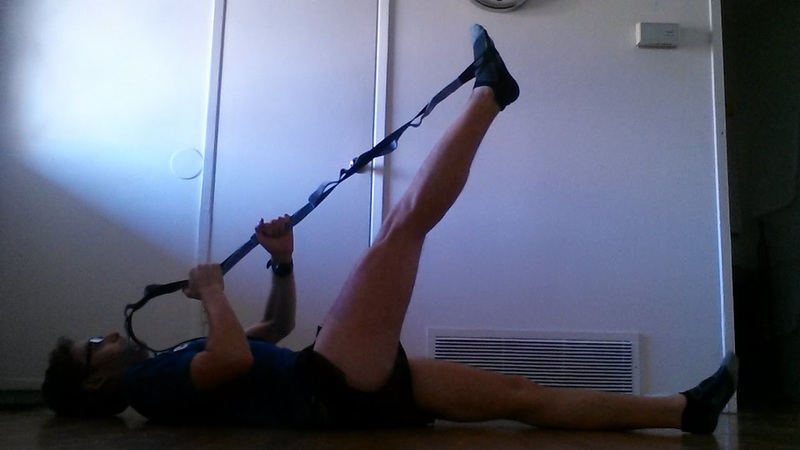 Lie on your back, bring your hip to 90 degrees of flexion, grab a rope and pull your dorsiflexed foot up to where you feel tension in the hamstring, calf or hip. Keep your foot dorsiflexed and oscillate between knee flexion and extension. DO NOT push into pain or extreme tension. Go up right before that happens but no farther. You do not want to aggravate your nerves. You want them to move better. Ankle Floss: Hold the hip still and the knee straight while you oscillate your ankle between dorsiflexion and plantarflexion. This technique is very similar to the hip nerve floss. For those with chronic calf tightness. Lie on your back and position yourself exactly as you did for the hip technique. This time however the hip should not move and you should oscillate your ankle between dorsilflexion and plantarflexion. DO NOT push into pain or extreme tension. Go up right before that happens but no farther. You do not want to aggravate your nerves. You want them to move better. I'm repeating this three times because this is a common mistake my patients make. So for those with chronically tight hamstrings or calf muscles, mobilizing the sciatic nerve at any of the above three spots may worth be a try. Nerve mobility is very important for normal flexibility and function. This is often overlooked and is important to check prior to aggressive stretching. It is important to not statically stretch nerves. That can irritate or inflame them. All nerve mobilizations should be performed as 1-2 second occilitations that should never be taken past the point of pain. I will also have a future post on the piriformis and the external rotators of the hip to address further address areas of sciatic nerve compression at the hip. Muscle and body soreness is normal after these techniques. More pain is not. If you continue to have pain please see your local healthcare professional. While these techniques work well for nerve mobility, if they do not help there may be a different pathology present. Shacklock, M. (2005). Clinical Neurodynamics. Philadelphia, PA: Elsevier.